This article investigates the sources of natural climate variation. This is a long post but it’s a big subject. Before you get half way through, your perception of the way things are, will have changed. You might even begin to smile inwardly, as if a burden had been removed from your shoulders. I begin with a description of the critical features of the atmosphere as I perceive them, and it is different to what you will find in Wikipedia or an IPCC report. Figure 1 shows the major wind systems, the location of the jet streams in the upper troposphere and the polar front. Were the vertical scale to be in strict accord with the horizontal, the atmosphere would be embodied in the line drawn to represent the perimeter of the Earth’s surface. About 75% of the mass of the atmosphere is held within 10 kilometers (6 miles) of the surface. Figure 1 is in that respect, a spectacular fiction. Suggesting that the composition of that skin, when change is reckoned in just parts per million, can change the temperature of the surface of the earth, is not good science. Were the atmosphere completely static, yes, but only to a very small degree. Still air is a fair insulator; moving air is no insulator at all. The greenhouse idea is too simple, too unsophisticated and too easy. It is a disabling thought pattern that climatologists must discard if they are to understand the system. Understanding the system is a pre-requisite to modeling it. Beyond an altitude of about 10km, the atmosphere changes in its composition according to the variable flow of nitrogen compounds from the mesosphere via the polar night jets and also the intensity of short wave radiation from the sun that splits the oxygen molecule, allowing the formation of ozone, but only to the extent to which the presence of oxides of nitrogen will allow. The ozone rich layer from 10 to 50km in elevation is called the stratosphere. The ability of ozone to trap long wave radiation from the Earth delivers increasing air temperature all the way to 45 km in elevation. At the equator the temperature that is reached is sufficient to melt ice but at the poles it is 10-20°C more. Increased ozone concentration at the poles increases stratospheric air temperatures despite a decline in the incidence of short wave radiation with latitude. The flux in ozone concentration is the prime agent of change in the temperature of the stratosphere and the upper troposphere. The stratosphere is Earth’s natural greenhouse umbrella. In that role it has the advantage over the troposphere that it is relatively non convective. But only where there is a downward transport of ozone into the troposphere do we see an impact of ozone on surface temperature. This impact on surface temperature is not due to back radiation, unphysical due to strongly countervailing processes within the troposphere, but flux in cloud cover that is a direct result of flux of ozone into the cloud bearing troposphere. In the context of the forces described above, the issue as to whether the proportion of carbon dioxide in the atmosphere is 350 parts per million or 550 parts per million is inconsequential (so far as ‘climate’ is concerned), but to the extent that it would enhance the productivity of photosynthesizing plants and marine organisms, enhancing evaporation, thereby cooling the near surface air and sustaining life, a little more rather than a little less would be desirable. CO2, along with nitrogen, is the fertilizer in the air. From the point of view of a plant, these are scarce building blocks and none more so than CO2 at just 380 parts per million. Can you appreciate the difficulty attached to finding a unique vehicle in a parking lot with 2,600 others. In order to survive a plant must select from the molecular parade, a molecule that is supplied in that ratio. The efficiency of plants in assimilating CO2, so rendering it a ‘trace gas’, is plainly evident in the savaging of the CO2 content of the global atmosphere in northern summer when the great bulk of the global plant life on land benefits from temperature that is warm enough to sustain photosynthesis. While there is water and carbon dioxide on Earth there will be plant life and CO2 will always be a trace gas. Paradoxically, as the CO2 content of the air rises, a plant uses less water and is capable of living in a drier environment. This has been a preamble. I hope you are ready to look at the climate system with new and inquiring eyes. The first part of my story is about atmospheric pressure and the winds. The second, to come at a later date, the clouds, and the third the sun and its influence on the distribution of the atmosphere and its circulations. Figure 2 Average sea level pressure by latitude in mb. Sea level pressure is higher in winter than summer, especially over Antarctica. Apart from Antarctica in winter, pressure is highest at about 20-40° of latitude in both hemispheres. This is the region of the traveling high pressure cells where air descends, warming via compression, promoting relatively cloud free conditions. The trades and the westerly’s originate here. Globally the lowest sea level pressure is experienced at 60-70°south latitude. This limits the southward travel of the humid north westerly winds and the northward travel of the cold and dry polar easterlies in the southern hemisphere. By contrast there is no such pressure trough in the northern hemisphere. That hemisphere will accordingly freeze or fry according to whether the easterlies or the westerlies prevail. Whether the prevailing wind is from the north or the south depends upon the balance of atmospheric pressure between the Arctic and 30-40°N. Because pressure relations change in a systematic fashion over time (will be documented below) this dynamic dictates the direction of temperature change in the northern hemisphere. By subtracting the sea level pressure at destination latitude from that at source latitude, the average pressure differential driving the surface winds can be calculated. Abbreviations: PENH (Polar Easterlies Northern Hemisphere), PESH (Polar Easterlies Southern Hemisphere), SW (South Westerlies), NET (North East Trades), SET (South East Trades), NW (North Westerlies). The strongest winds are found in Antarctica in winter. The differential pressure driving the surface winds falls away from south to north. Figures 2 and 3 taken together suggest that there is fundamental difference between the hemispheres, a theme that will run throughout this post and an understanding that is essential if one is to appreciate the source of change in surface temperature over time. With the exception of the Trades and the Westerlies in the southern hemisphere (where there is little difference between the seasons) the differential pressure is noticeably higher in winter. In the Arctic the differential driving the surface polar easterlies is only weakly positive, a marked contrast to conditions in the southern hemisphere. Consequently the dominant wind from 30°N latitude to the Arctic is the South Westerly, bringing warm moist air to the highest latitudes, rendering land masses that are to the north of the Arctic circle marginally useful to man, at least in summer, a situation very different to that which prevails in the Antarctic where the warmest locations may thaw for just one month in a year. The hemispheres are so different that it is really like two planets in one. The Trade winds of the northern hemisphere are much stronger in winter, and stronger than the southern Trades in any season, but the southern trades are more constant. In northern summer the north east trades are weak. The average tells us little about the habitability of a place. We need to appreciate the extremes. Figure 4 records the difference between the highest and lowest monthly average sea level pressure for the four summer and the four winter months taken as a group. It is plain that variability increases with latitude. Variability is greater in the southern hemisphere and greater in winter than summer. In the northern hemisphere winter variability in is almost twice as great as summer variability. The flux in pressure at the highest latitude of the northern hemisphere is almost as great as it is in the southern hemisphere. This has important implications for the variability in climate in the entire hemisphere because the north lacks the stabilizer of the low pressure trough at 60-70° south latitude that is apparent in figure 2 and also in the map that heads this post. The northern hemisphere might be characterized as ‘an accident that is waiting to happen’. 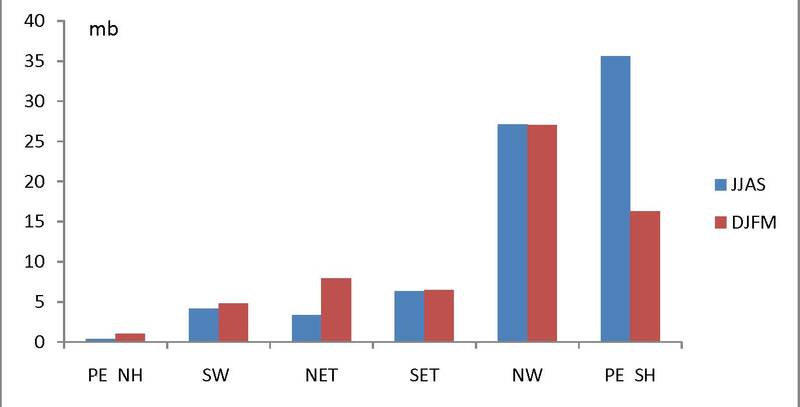 Figure 5 Difference between sea level pressure extremes for winter and summer, a measure of the swing between the seasons. Figure 5 shows the extent of change in the extremes of the pressure differentials between summer and winter. 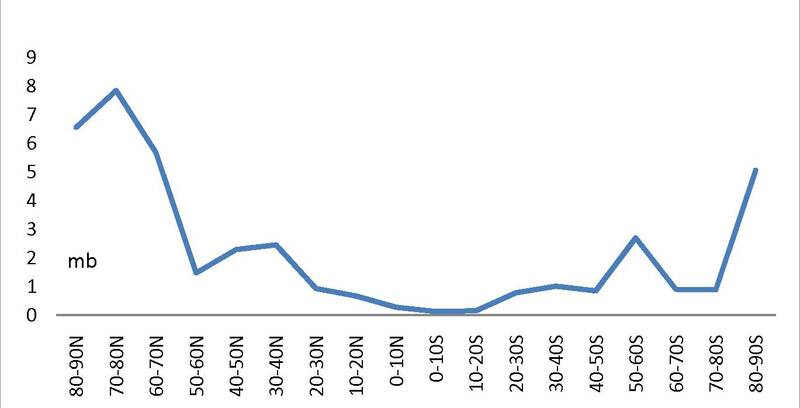 This statistic is simply the difference between the curves in figure 4. Latitudes pole-wards of 60°north and 80° south see the most extreme shift between summer and winter. This diagram gives us a measure of the extent to which the atmosphere can shift about, affecting wind direction and strength, within the space of a year. The ‘lumps and bumps’ at 30-60°north and 40-70°south relate to the ‘annular mode’ or ‘ring like mode’ associated with the flux in ozone from the winter pole and associated geopotential height anomalies, the atmospheric heating via the absorption of long wave radiation from the earth by ozone. This generates change in cloud cover with associated flux in sea surface temperature. This is the essence of the Northern Annular Mode (the Arctic Oscillation) and the Southern Annular Mode (The Antarctic Oscillation). Describing this mode, and the origin of its locomotion, will be the subject of the second post in this series. What figure 5 does not reveal is the extent to which the atmosphere can shift between one hemisphere and the other, something that changes the dynamic in the annular modes over time. Flux within just a single hemisphere is something that never actually occurs and yet you would think, from our reliance on the AO and the AAO that it is of no importance whatsoever. Wrong. 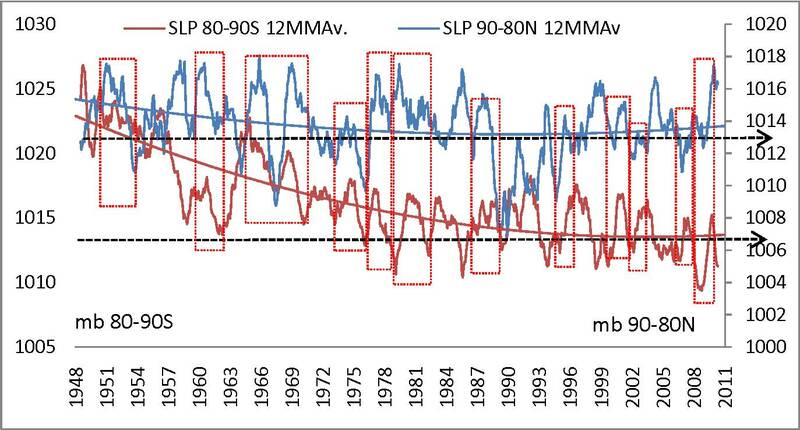 Figure 6 shows that there has been a systematic loss of atmospheric pressure at the poles since 1948 and a partial recovery. Trend lines are second order polynomials. 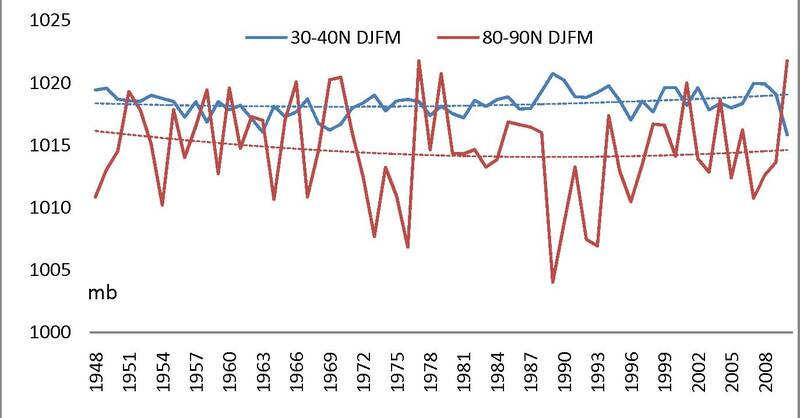 Notice the upward trend in Arctic pressure in winter after 1989 (black line). The loss in pressure in both polar jurisdictions up to 1989 indicates external forces at work. Antarctic winter pressure is yet to bottom. Otherwise pressure appears to have bottomed in the 1990’s. As Antarctic summer pressure has increased just a little, Arctic pressure has increased a great deal. As we shall see this will change the climate of the northern hemisphere. Change in distribution of atmospheric mass affects the differential pressure driving the winds. 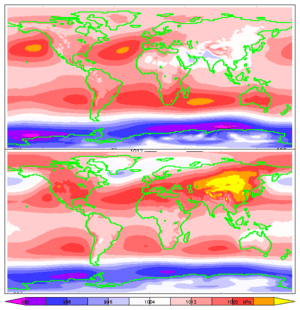 Figures 7 and 8 show the changing distribution of atmospheric mass over time in two key latitudes in the northern hemisphere. 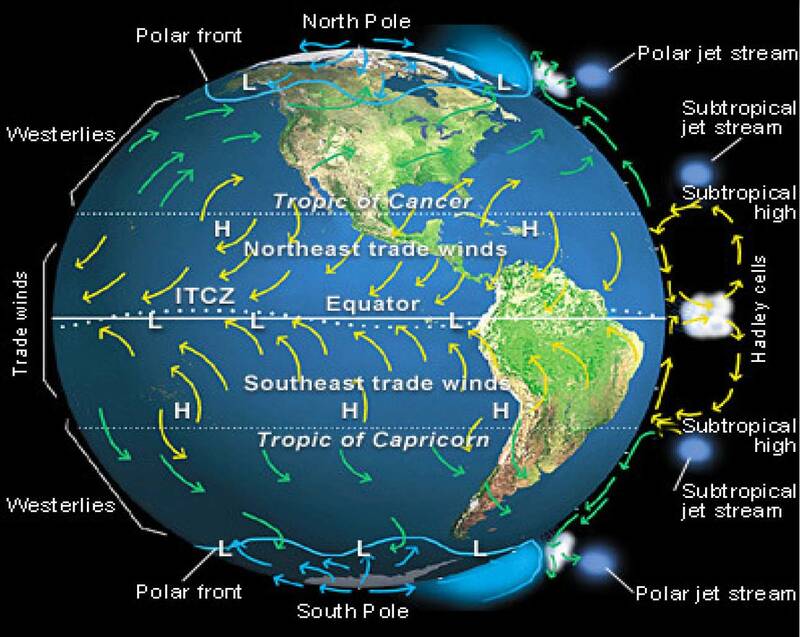 In summer, the increasing atmospheric mass at latitude 30-40°north and diminishing atmospheric mass at 80-90°north increases the domain of the south westerly winds warming the high latitudes. The trend lines suggest that a reversal of this process is underway. Figure 8. Pressure at 80-90°north and 30-40°north in December, January, February and March. Mb. In winter (figure 8), atmospheric pressure at 30-40°north latitude has been slowly increasing since 1948 and mass over the Arctic fell away till 1990 favoring the Westerlies over the Polar Easterlies. But pressure has recovered in the Arctic since 1990. When the brown line rises above the blue, the easterlies dominate and a cold winter is experienced in the northern hemisphere. The latest data in figure 8 relates to the winter of 2009-10. A falling AO indicates a change in pressure relativity favoring the Polar Easterlies. A rule of thumb is that surface atmospheric pressure in the Arctic is inversely related to the Arctic Oscillation Index. When the AO falls, pressure is rising in the Arctic. In all the following diagrams except the last monthly data is reported. The statistic is the anomaly. I calculate the monthly average for the entire period 1948 to November 2010 and the anomaly represents the departure from that average. The changing pressure differential driving the surface winds indicates the nature of monthly weather and to the extent that it departs from the average in a systematic fashion over long periods of time represents climate change in action. 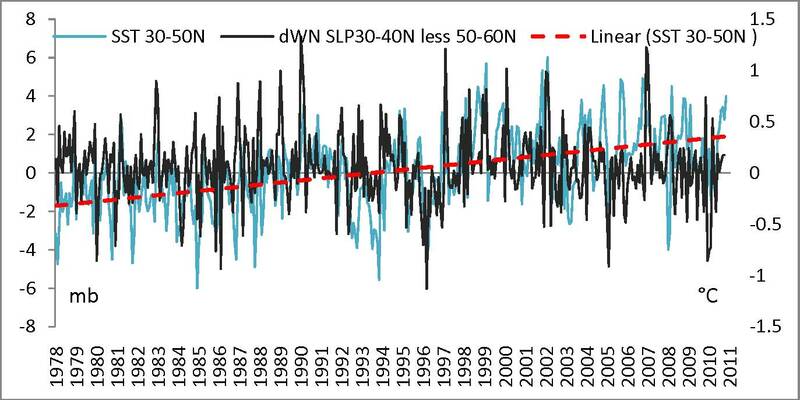 Figure 9 Anomalies in differential pressure between 30-40°N and 50-60°N (differential Westerlies North) and 50-60°N and 80-90°N (differential Easterlies North) Monthly data. Mb. The data in figure 9 relates to the northern hemisphere. The monthly anomalies reveal a flux in the differential pressure driving the Polar Easterlies (right hand axis) that is about three times the flux in the differential driving the Westerlies. Weak easterlies are sometimes associated with strong Westerlies, but for much of the time, surprise, surprise, the two move together. For both the Easterlies and the Westerlies to advance at the same time an inter-hemispheric redistribution of atmospheric mass is required allied with an intensification of the low pressure cells where the two converge (polar cyclones). This generates weather extremes. Rest easy. These are naturally generated extremes. Records tend to be broken at both ends of the spectrum. More heat and more cold. The paradigm of the Arctic Oscillation takes no cognizance of this inter-hemispheric shift in pressure and cannot therefore fully account for the change in weather and climate that occurs. The second order polynomials in figure 9 suggest a cyclical pattern of change. 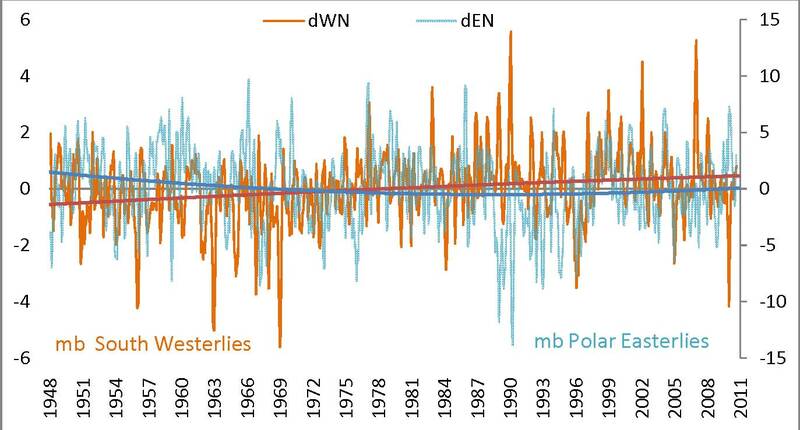 The dominance of the Westerlies after 1978 is associated with warming winter temperatures and melting ice sheets in the Arctic a reversal of the circumstance that caused the Arctic to cool for thirty years up to the late 1970’s. When the pressure differential is negative the wind ceases to exist and another takes its place blowing from the opposite direction. If you cover the bottom part of the graph below the zero point and inspect the curves above that point you get an idea of how the wind direction and temperature has changed over the course of time. 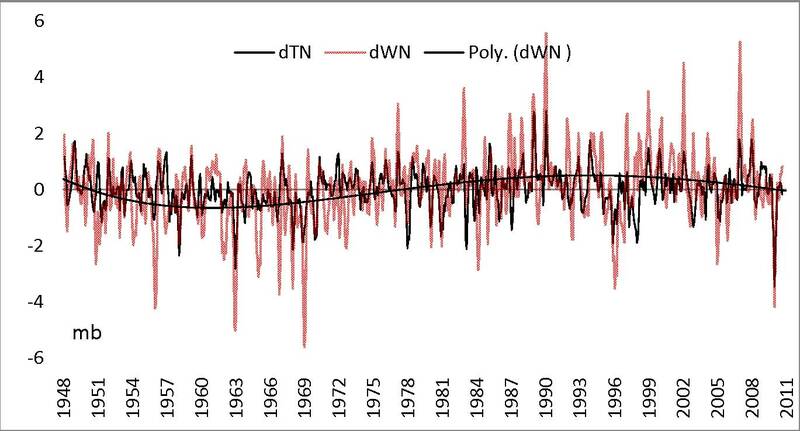 Figure 10 Anomalies in differential pressure between 30-40°N and 0-10°N (differential Trades North), 30-40°N and 50-60°N (differential Westerlies North) Monthly data. Mb. Figure 10 reveals that the Trades and the Westerlies of the northern hemisphere vary together. Again, the polynomial (3d order) suggests reversible phenomena. This diagram is a representation of a climate system oscillating about a mean state in a fashion that makes it very difficult to model unless the forces moving the system away from the mean state are recognized, are quantifiable and predictable. If you cannot do this forget about modeling. Figures 11 and 12 break new ground in understanding climate science. The connection between cloud cover and ENSO is apparent. dWN (differential pressure between latitude 30-40°north and 50-60° north, the pressure driving the South Westerly winds in the Northern Hemisphere). 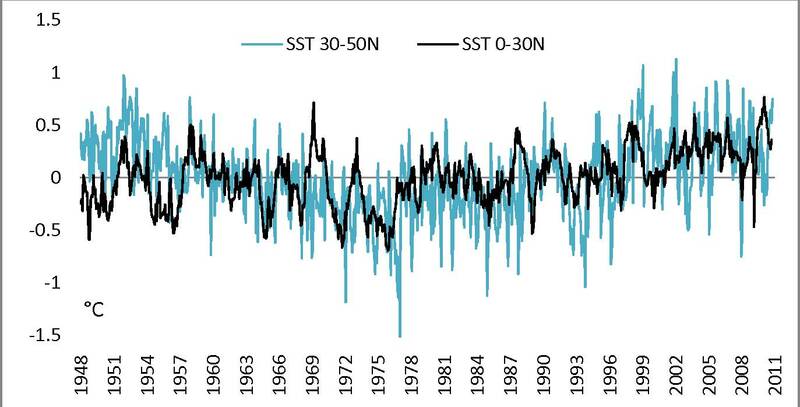 SST (Sea Surface Temperature). Figures 11 and 12 show us that the temperature of the sea in the mid latitudes of the northern hemisphere varies directly with the differential pressure driving the Westerly winds. When the wind blows harder we expect the sea to cool. But it warms. One infers a loss of cloud cover. The cooling of the sea between 1948 and warming thereafter are entirely accounted for in the shift in the mass of the atmosphere that lies behind the change in wind strength and the flux in ozone that causes the cloud cover to change. The explanation of the ozone dynamic must await the next post. The warming of the sea in the northern hemisphere in winter is the distinctive feature of climate change as it has been experienced over the last thirty years. 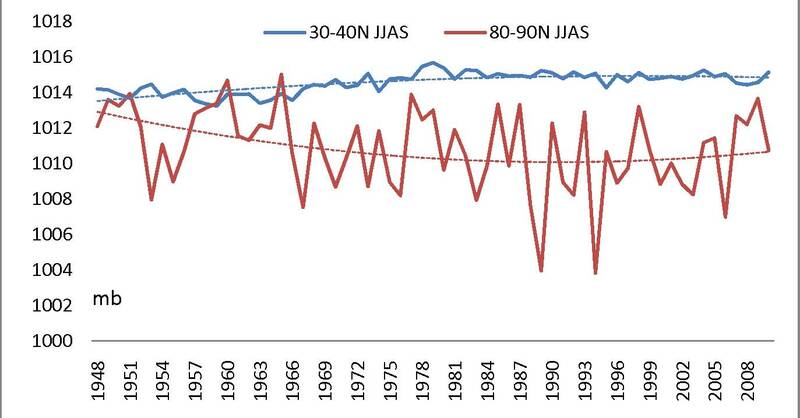 The cooling of the sea in the northern hemisphere between 1950 and 1978, under the influence of changes in the distribution of atmospheric mass, provides the key to an explanation of climate change. 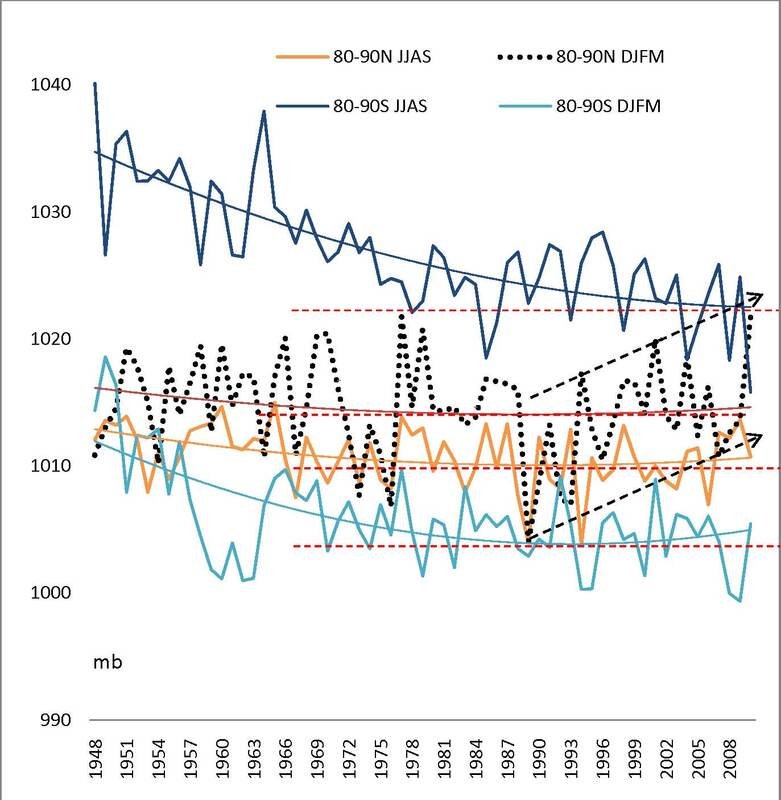 Figure 13 Evolution of sea surface temperature in mid and low latitudes of the northern hemisphere. Figure 13 shows that the temperature of the sea between the equator and 30°north follows the temperature of the sea at 30-50° north but in a less agitated fashion. It appears that the cloud cover response in tropical waters is less energetic than it is in the mid latitudes. I suggest, no I insist, that the ENSO phenomenon in the Pacific, and climate change on all time scales, is ultimately due to changes in cloud albedo. ENSO is not climate neutral. ENSO is not a driver of climate change. It reflects climate change as it happens just as the ripples on the sea reflect change in the wind. Global temperature trends are not confounded by ENSO dynamics. ENSO is part of the whole, integrating the effects of change that occurs in latitudes where the cloud dynamic is more sensitive than it is in the tropics. 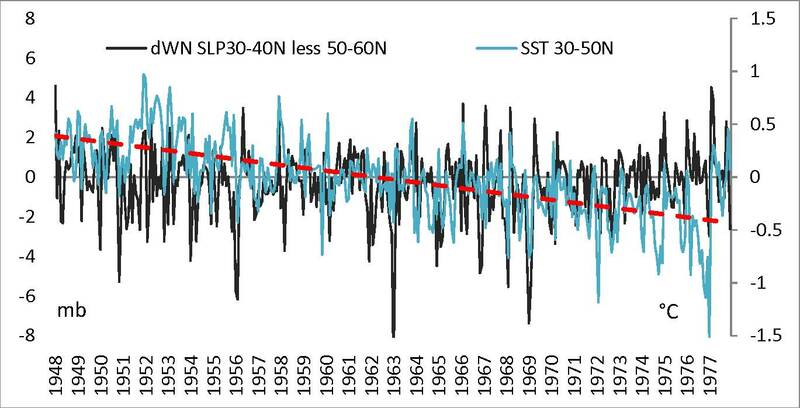 Figure 14 dWS (differential pressure between latitude 30-40° south and 60-70° south) SST (the temperature of the surface of the sea between 30-50°south latitude). Figure 14 shows that the temperature of the sea in the southern hemisphere moves with the strength of the westerly winds in a very similar fashion to that seen in the northern hemisphere. I repeat that the dynamic behind this phenomenon is the flux of ozone from the winter pole as atmospheric mass moves to and from the pole, enhancing or limiting the flow through the night jet thereby metering the flow of nitrogen oxides from the mesosphere. When NOx flow is reduced ozone concentration rises. Ozone finds its way into the upper troposphere as can be seen in any map of 200hpa height anomalies. Sea surface temperature responds precisely in accord with this spatial pattern. As the upper troposphere warms the cloud evaporates. 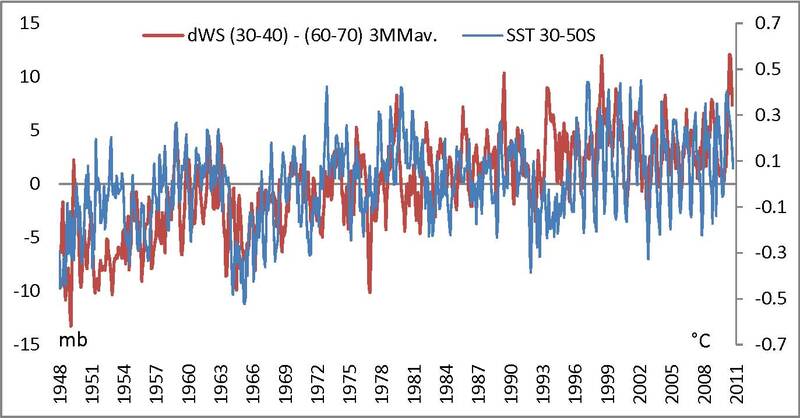 At the root of the increasing temperature of the sea is the long term shift in atmospheric mass away from the Antarctic, and the consequent increase in the temperature of the stratosphere in the southern hemisphere prior to 1978. The slow build of pressure at 30-40° south and the increase in the strength of the westerlies is just collateral damage. The decline in rainfall in my part of the world (South West Australia) is part of this phenomenon. High pressure cells are relatively cloud free and have dry air. As the Antarctic regains the atmospheric mass that it has lost, the high pressure cells of 30-40° south will shrink and the frontal action that brings the rainfall will move north again. 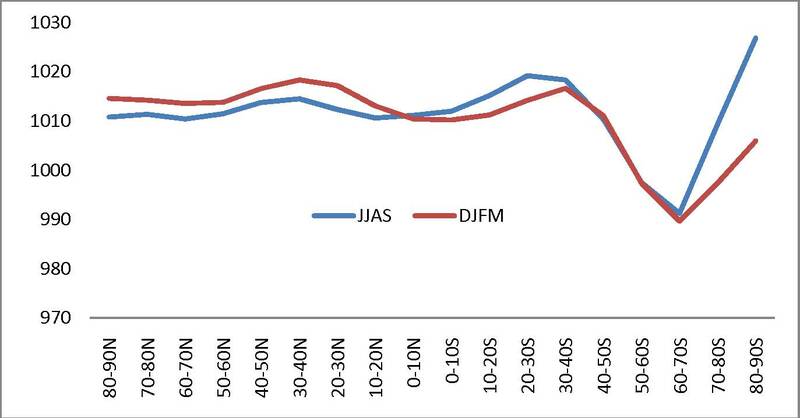 Figure 15 shows a 12 month moving average of polar pressure. It suggests that polar pressure is currently increasing at both poles with the Arctic leading the way. Frequently both poles experience a loss or gain of mass at the same time. 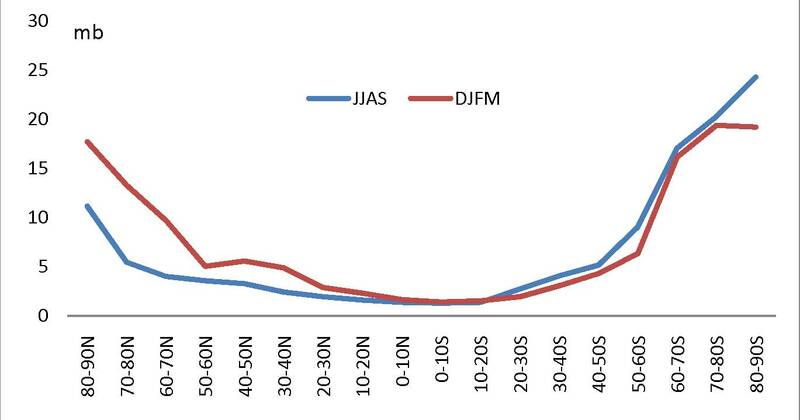 This suggests a dynamic where the interchange of atmospheric mass is primarily between high and low latitudes. Something attracts the atmosphere away from the poles, weakening the polar easterlies and strengthening the Trades and the Westerlies. This is plainly associated with loss of cloud and surface heating. Inversely as surface pressure increases at the poles the flow of NOx from the mesosphere will increase, ozone concentration in the stratosphere will fall and surface temperature will fall. Atmospheric mass is returning to the poles especially in the northern hemisphere, particularly in winter when it matters most. The second post will trace the flux in ozone from the polar stratosphere that erodes cloud cover in the mid and low latitudes. The third post will describe a force that shifts the atmosphere between the poles and the equator and between the hemispheres causing the winds to wax and wane, the clouds to come and go and the sea to warm and cool. This is a force that is external to the Earth. So I see the Climate System as responding to external stimuli. It is an open system with ever changing parameters. I’m wondering if you ever accept guest posts? I have some interesting articles written about new advances in renewable energy that I think your readers at Climate Change1 would find interesting. If a guest post is something you would consider I would be more than happy to send an article along, just let me know! Any idea when post 2 and 3 will be ready? So, teams of top-flight climate scientist working on sophisticated global circulation models don’t understand the atmosphere as a system and you do? And yes, of course there is a difference between the Northern and Southern hemispheres, given that there is one heck of a lot more ocean in the Southern Hemisphere…Given the level of this blog, I would look more deeply into the methodology employed by those no-nothing GCM modelers before making such unfounded pronouncements. Thank you for your comment. Whether my observations are unfounded or not is a matter for the judgement of the individual reader. Let me observe that the pattern of historical change in temperature by latitude and hemisphere is incompatible with the greenhouse hypothesis. All the mathematical sophistication that can be mustered is of little value if it is harnessed to a model of the atmosphere that can not account for the changes that we observe. Addendum: I will admit that “greenhouse effect” is a rather poor misnomer. The process is one of secondary excitation of carbon dioxide, methane, low level ozone, etc. in the troposphere by Earthshine and reradiation of longer wavelength infrared radiation. There is no “greenhouse,” “blanket” etc.